Abengourou is a city in eastern Ivory Coast. It is the seat of both Comoé District and Indénié-Djuablin Region. It is also a commune and the seat of and a sub-prefecture of Abengourou Department. 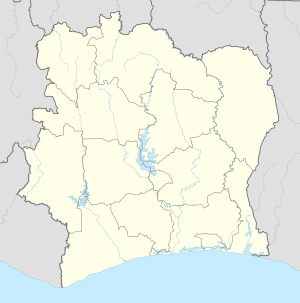 Abengourou is primarily populated by the Anyi ethnic group, a branch of the Akan people who migrated to the region from Ghana. In the 2014 census, the population of Abengourou was 135,635. The city is served by Abengourou Airport. There is also the interior's largest hospital. There is an agricultural vocational training institute, along with a research station that specializes in the local crops of cocoa and coffee. These crops are then transported the 151 kilometres (94 mi) to Abidjan for export. Within the city is the residence of the Anyi paramount chief, who is also the King of Indénié. His home was built in 1882 and is decorated with artifacts. The name "Abengourou" stems from the Akan language expression "n'pé kro", which means "I don't like long discussions". The city is home to the Roman Catholic Diocese of Abengourou, with its cathedral at the Cathédrale Sainte Thérèse de l'enfant Jésus. ^ "Côte d'Ivoire". geohive.com. Retrieved 5 December 2015. ^ a b c Hoiberg, Dale H., ed. (2010). "Abell, A(runah) S(hepardson)". Encyclopædia Britannica. I: A-ak Bayes (15th ed.). Chicago, Illinois: Encyclopædia Britannica Inc. p. 26. ISBN 978-1-59339-837-8. Wikivoyage has a travel guide for Abengourou.